Stalk thy prey and let loose thy talons on the Darkness. The Hawkmoon. A weapon designed for that avid Gunslinger that lives by each moment and survives by their gun. Hawkmoon makes every bullet fired count, although some do count more than others. The Hawkmoon is a weapon that will reward you with great power if your aim is true and your luck intact. It has a slow fire rate but also has a high impact so you will need to make sure that every shot you fire counts and you will breeze through your enemies. It also has a significant range for a hand cannon meaning you can dominate the field even over large distances, although you should probably stick to close or medium range in order to get the best results. This exotic has two unique perks that have similar functions. The first, Luck in the Chamber provides one random bullet in the magazine with considerable bonus damage, assuming that it hits your target. The second exotic perk, Holding Aces, provides two more random bullets in the magazine with considerable bonus damage. This is 3 shots out of 13 that will deal a significant boost to damage output and you will know what bullets these are by a high pitched ring that will sound as the bullet is fired. These perks can not only allow you to push a powerful offensive but also to act as a last minute saving grace if you are losing a particular firefight. 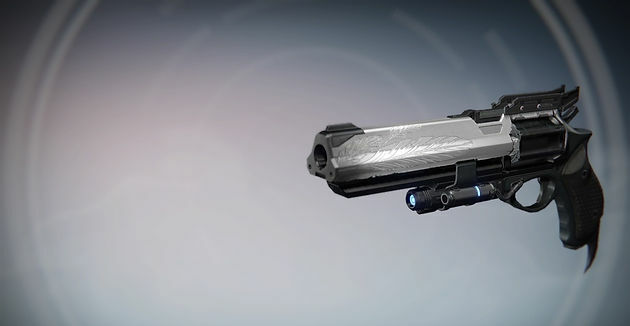 The Hawkmoon can be used with great success in PVP and PVE as the large magazine means you can put out more damage and get more kills before having to reload as well as the exotic perks enable you to breeze through your opponents regardless of what arena you use it in. Hawkmoon is a beautiful weapon and it seems to exude elements from a culture that takes pride in their firearms as a form of not only destruction but of art. The silver and black colouration of the weapon is not only intimidating but also quite badass and presents a stark contrast to each other. These two colours serve to make Hawkmoon stand out without making it bland and boring by having one colour overbear the other. There are two features that also play into the very name of the weapon with the references to the Hawk, a bird of prey. These are the engraved feathers on the side of the barrel which run almost the full length of it and the pointed talon going down off the bottom of the grip. This is not only an awesome design element but also shows that this weapon of precise shooting and devastating impact can also be used as a pretty effective club. The Hawkmoon can be gained from an exotic primary engram or purchasing it from Xur if you are lucky enough for him to have it in his inventory.